Q: Can I see a sample Online Store? You can see ALL our customer online stores in our Online Store Gallery. Q: How much does an Online Store cost? We have several store sizes available for any budget or need. Plans start at $19/month for a 50 item store, $24/month for 100 items, $29/month for 200 items, $39/month for 500 items, or $59/month for Unlimited. Most owners choose to list their most special items that can be easily shipped. Q: How do I load items into the Online Store? 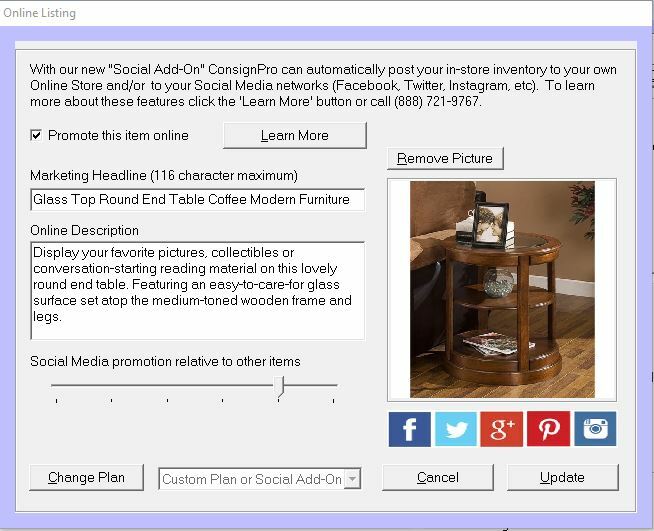 In ConsignPro, click the "Promote Online" button on the Add/Find Inventory screen and complete the Online Listing screen. The items you choose will be automatically uploaded that evening to your Online Store (or sooner if you prefer). Q: How do I load item photos to the Online Store? You can either take pictures with a digital camera, transfer them to your computer, and select them in ConsignPro, or use our remote photo loader and upload photos directly from your SmartPhone or tablet camera! You can also have multiple pictures of each item. Q: How do I get paid for items that sell? Your Online Store shopping cart service is linked directly to your PayPal account. Payments go directly into your account and you are notified when an item is sold. Standard PayPal fees apply to each purchase. As such, a PayPal account is required. Q: Can I just display items rather than sell them? Yes. In your Control Panel, check the "Catalog Only" box and the shopping cart will be removed from your Online Store. With this option, no PayPal account is required. Q: Do I need a website to use your Online Store? No. In fact many customers use our Online Store AS their store website and promote the address to their customers via business cards and marketing materials. You can even bring your own URL. Q: Can I customize my Online Store? Q: Can I link my existing website to my Online Store? Yes. You will be provided an attractive URL (link) to your Online Store (e.g. http://myresaleweb.com/4ravensgallery). If you prefer we can also help you setup "shop.yourexistingwebsite.com" with minimial effort. You can link to either. Q: How do I drive traffic to my Online Store? Items are automatically fed to the Google Product Search engine. You should also promote your new URL via your website, social media platforms, and other marketing channels. To further promote your store, consider adding our new Social Media Add-on! Q: What do I do if an item sells online? When an item sells online, PayPal will notify you immediately via email. At that point, you should sell the item in ConsignPro via our Make Sale screen. ConsignPro will immediately mark the item as sold online. Q: How do I charge for shipping and sales tax? Q: Where do I set the item Category and Title? The item Category is set using the "Type" field in ConsignPro. The item Title is set using the "Description" field in ConsignPro. Your Online Store can be searched and a menu of categories of items appear to the left. Q: Can I get help when I need it? We stand behind our products and services. Our fast and effective support team is at your service. We take good care of our customers. We're here to help you and we have been for over 20 years!!! Simple. Visit our secured Order Page and add the "Online Store Builder" to your cart. Select the store size you'd like from the drop list and then "Checkout". Your store will be built for you and instructions sent by email. Q: Have any tips for success? Our owner created an informative letter to Online Store customers where he shares his ideas on making the most of your new Online Store. From loading it with items to promoting it to adding our Social Add-On. Read his tips here.